When I was first introduced to InteraXon, a device was placed on my head and I was told that if I focused my thoughts, I’d be able to control the images I was looking at on a screen. No, this is not an episode of Star Trek – its everyday business at InteraXon, where the company is positioning itself to help companies integrate thought controlled computing into their existing products and business plans. I recently had a chance to chat with Ariel Garten, InteraXon’s CEO. Here’s a sneak peak into our conversation. Q: What is InteraXon all about? 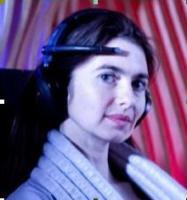 A: The technology is made up of software and hardware that converts brainwaves into digital signals that can be understood by a computer – and ultimately, control anything electronic. The technology does not read your thoughts, but instead, reads the overall electrical pattern activity that accumulates outside your head. Our team of neuroscientists, engineers and designers understand and shape the technology as well as defining and designing intuitive applications of it. Q: How is the solution being used today? A: InteraXon was featured at the 2010 Vancouver Olympic Games, where participants could control lights on the Parliament Buildings, the CN Tower and Niagara Falls using only their thoughts. Cameras fixed on the landmarks captured the changes and relayed video back to Vancouver, so users could see the effects of their thoughts in real time. The applications go further than that though. From a business perspective, the technology could be used for example with patients that have attention deficit disorder to focus their attention and thoughts, with business executives in need of relaxation while on long flights, and with drivers to monitor their alertness while on the road. Q: What does the future hold for InteraXon? A: Thought-controlled computing has the potential to become another way that we interact with objects – just like a keyboard, mouse or voice-activation. There are many applications for this technology, and we are receiving many interesting inbound calls from companies eager to learn how they could work with us to leverage thought controlled computing to advance their products and services. One area that we are working actively is in mobile. Stay tuned for some interesting advances in that space, and other markets.